This episode: Adding adapters to anti-cancer virus helps it avoid destruction by the body so it can target the tumors! Thanks to Dr. Andreas Plückthun for his contribution! Schmid M, Ernst P, Honegger A, Suomalainen M, Zimmermann M, Braun L, Stauffer S, Thom C, Dreier B, Eibauer M, Kipar A, Vogel V, Greber UF, Medalia O, Plückthun A. 2018. Adenoviral vector with shield and adapter increases tumor specificity and escapes liver and immune control. Nat Commun 9:450. What’s new: Now, Andreas Plückthun and colleages, publishing in Nature Communications have modified a respiratory virus to be able to target certain cancers specifically for gene therapy! Where are the rest going? If we want to use the virus for actually curing a serious disease, for example cancer, we have to achieve three things: first of all we have to get rid of the viral genes that cause these symptoms, and have to replace them by genes that encode something useful, for example make a therapeutic protein, or several therapeutic proteins. The second thing that we have to achieve is to teach the virus to infect those cells that we tell it to. The third thing that we have to achieve is to hide the virus from the immune system and from other cells that it shouldn't infect. And so in this paper, we have described how we solved these problems. 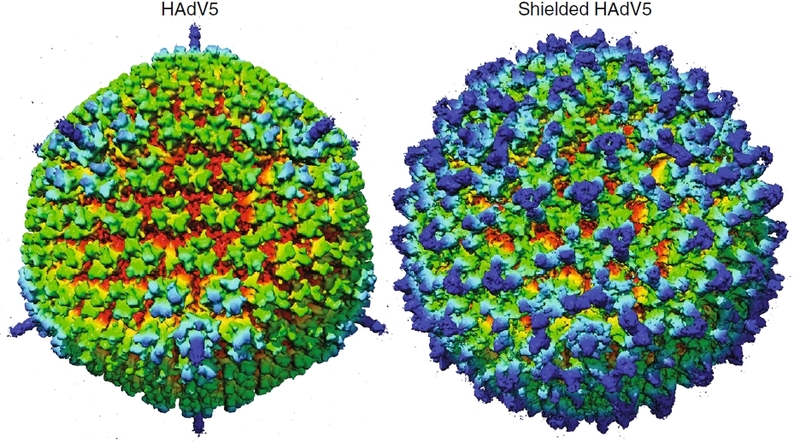 So to make the virus bind particular cells, you have to know what the structure of the virus looks like. It's an icosahedron, and at the vertices, comes out a fiber and at the end of this fiber is a fiber nob. So we've made an adapter that binds to these fibers extremely tightly, it doesn't come off over ten days, and at the end of this adapter is yet another protein which we can freely choose, which makes it bind to particular receptors, for example on cancer cells. And so thereby the virus gains affinity for the cancer cells. So the third thing we had to do is hide the virus from the immune system and from other cells that it shouldn't infect. And for that we used a single-chain antibody which we again trimerized so that it binds extremely tightly, and thereby hides the virus from the immune system and from other cells. So we've injected this heavily engineered virus into the tail vein of mice, and found that it really infects cells in the tumor. So we're very excited about that.